It’s like they can see us through the screen! Lyra Heartstrings amassed a fan following that most background ponies can only dream of, and she did that by sitting on a bench. My Little Pony fans read into her strange posture and immediately came to the conclusion that the green little pony had an odd human obsession. The fanfiction, Anthropology, did a lot to propel this theory into the head cannons of Bronies everywhere. Anthropology is one of the few fanfics that inspire their own fan works (such as the video above). Lyra made her first appearance in Episode 1, where we saw her waving at Twilight Sparkle as she rushed by. Amending Fences confirms that Lyra was in Twilight’s circle of friends – or, that is to say, the circle of friends who tried to make friends with Twilight. 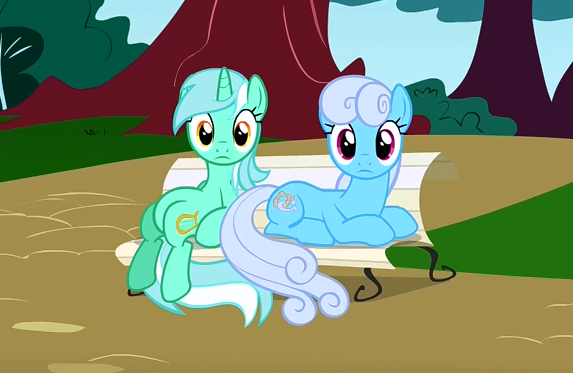 This episode also confirmed that Lyra moved to Ponyville. Lyra got her first speaking line in episode 100, Slice of Life. A lot of people say she got her first line in Royal Canterlot Wedding, but they forget that this was actually a changeling. Episode 100 also gave a nod to fan theories that Lyra and Bon Bon are a couple. Hasbro didn’t go that far, at least not overtly, but they were certainly best friends.